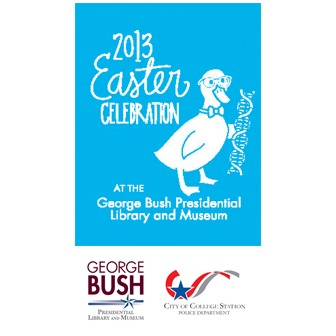 The College Station Easter Celebration will be held March 23, 2013 from 9:30 a.m. to noon at the George Bush Presidential Library and Museum. Activities will include entertainment, games, face painting, an Easter egg hunt, egg roll, egg toss, complimentary refreshments and photos with the Easter Bunny. Specially designed wooden White House-style Easter Eggs are given to the children. Local merchants contribute prizes to give away, and a boy's and a girl's bicycle and helmet will be awarded in each of the three age categories: 3 and under, 4-5 and 6-7. Parents must register their children to win. A kite-flying contest will begin at 11 a.m. in the field across from the Bush Library and Museum. Children and adults who want to participate must bring their own kite. Barbara Bush Drive will be closed to traffic before and during the event. 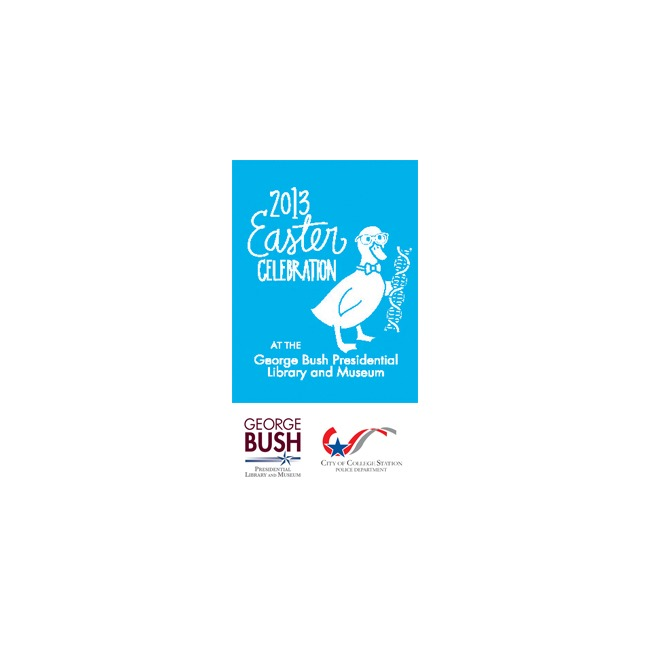 Participants should access the museum via Research Drive, Discovery Drive or John Kimbrough Blvd. Parking will be available in the museum parking lot and Bush School lot (PA 111). Handicapped parking will be available in the museum parking lot. The College Station Easter Egg Hunt has been a long standing tradition hosted by the Police Department. From humble beginnings in 1982, the Easter Celebration has evolved into one of the most highly anticipated events of the spring. The Bush Library and Museum began partnering with the police department in 1999, adding activities to the event modeled after the annual White House Easter Egg Roll.